This has been one of my favourite wines for many years; I love the clean refreshing note that makes it so easy to drink. Lovely vivid pure blackcurrants and dark cherry fruits. Captivating wine to serve with cold meats, pork and chicken dishes. 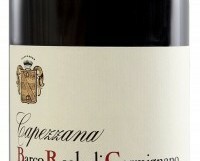 Capezzana is a lovely large family-owned and run estate in Tuscany. As well as producing some excellent wines and a great olive oil, there is a cookery school, a small hotel and a wine bar. If you go there on holiday, it is well worth a visit.